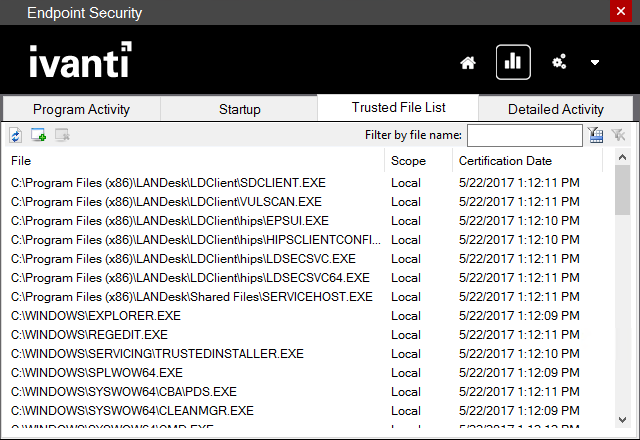 Use the Ivanti Endpoint Security application to monitor and manage Endpoint Security activity on your computer. To open the Endpoint Security application, double-click its icon in the Windows taskbar notification area. Application control: Monitors software activity and prevents malicious software from executing. Whitelist: Prevents programs that aren't on an approved list from executing. Firewall: Protects you from unauthorized network connections. Device control: Monitors and restricts attached device access. Restrictions can be placed on wireless connections, USB thumb drives, and so on. 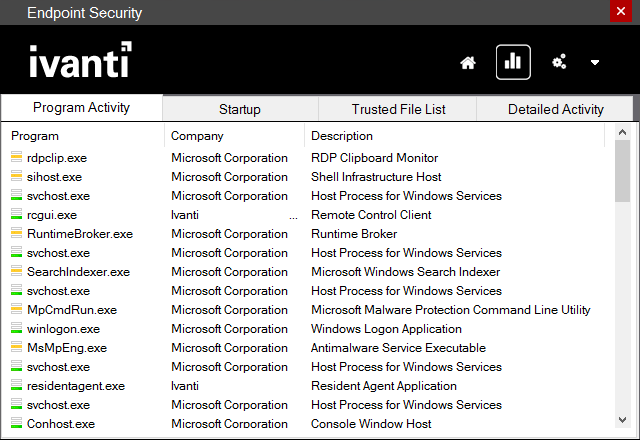 Depending on how your Ivanti administrator configured Endpoint Security, some components may be disabled. 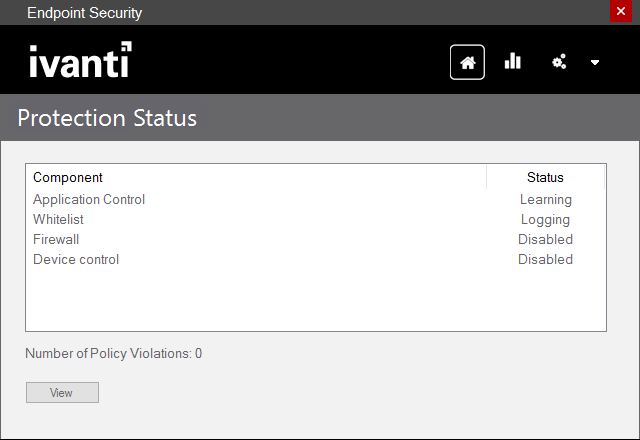 If you're authorized by a Ivanti Administrator with Endpoint Security rights, you can also use the Endpoint Security application to enable/disable and customize Endpoint Security component configurations. If your administrator hasn't authorized you, you can still use the application to view Endpoint Security settings and information. Non-administrators can also request access to a restricted operation by providing an administrator an unique authentication code that's in the Restricted operation password dialog box. For information on using restricted operations, see the Ivanti® Endpoint Manager powered by Landesk online help. Blocking: Security violations are blocked and reported. Clicking the View button opens the detailed Endpoint Security activity log, where you can see policy violations and other activity. Red: The program has no Endpoint Security permissions or restrictions configured and so it runs without restrictions. Yellow: The program has some Endpoint Security permission restrictions. See its permissions details for more information. Green: The program has all Endpoint Security permissions and runs without restrictions. Cick Details to see Endpoint Security settings affecting that program. Users with Endpoint Security administration rights can modify program permissions and add or modify trusted file list programs. Changes here only affect the selected process. For example, if there are two notepad.exe processes, modifying the permissions for one won't affect the other. If you make changes and don't select Add to local trusted file list, your changes are temporary and only last until the selected program ends. Click Terminate to forcefully end a program (Endpoint Security administrator-only). To prevent data loss, only do this for programs that are unresponsive and when there's no other way to end them. Click Notify to toggle the notification status. When enabled (the default), Endpoint Security violations involving that program will trigger a popup in the Windows notification area on the taskbar. If you don't want to see these popups for a program, disable this option. When disabled, violations will still be logged. If you right-click an item you can view the items details. The Date field shows when the startup item was added. Dates are only available for startup Items added after Endpoint Security was installed. 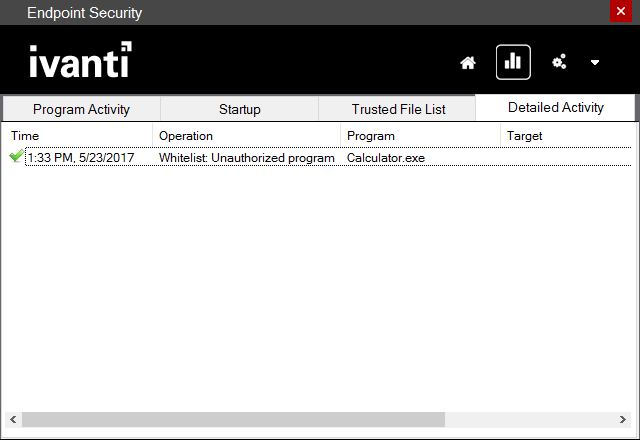 If your Ivanti administrator allows, you can also enable/disable startup items. The Trusted file list report tab shows files on the trusted file list that your administrator has configured. Files on this list are trusted and can bypass application control restrictions. This list refreshes in real-time. 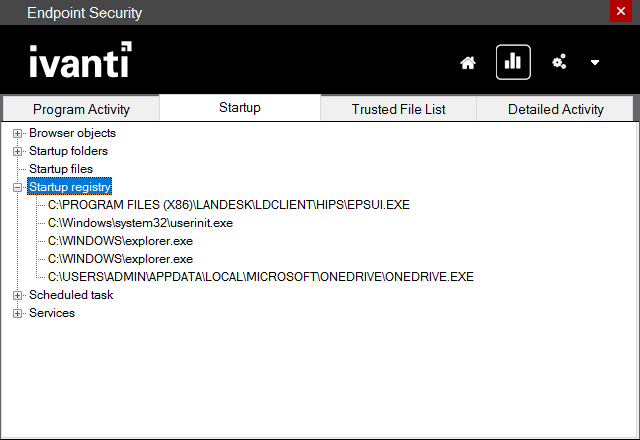 Ivanti administrators can add entries to the core server's trusted file list. Other modifications to the core server's trusted file list must be made from the Endpoint Security for Endpoint Manager console. All other changes you make here are local to your computer. The Detailed activity report shows Endpoint Security log events and security violations. Request exception: Send a request to the administrator asking that this file to be added to the core’s trusted file list.